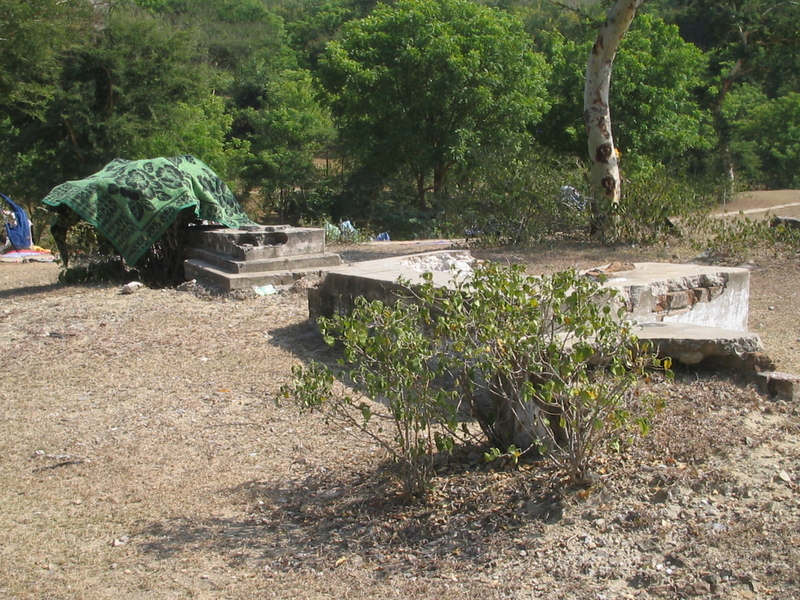 The Burial Register for St Anthony's does exist, but could not be located. The old Christian cemetery (right) was the site of a desperate battle in WWII and although evidence of the burials and some graves still exist, I couldn't find anything that would help to identify the occupants. If anyone wishes to visit the site, it is quite easy to find, as can be seen from this map, lying on a low ridge just north of the Thazi road as you leave town. The new cemetery is about 12 kms north of town and has no European graves at all. It is also a pretty dreary and depressing scene. St Anthony's Church holds copy records from Myintgyan and Yamethin. I suspect the Myintgyan book was brought here when a priest was being relocated and it seems clear that Yamethin and Meiktila parishes were combined at some stage and the parish priest was responsible for both churches. 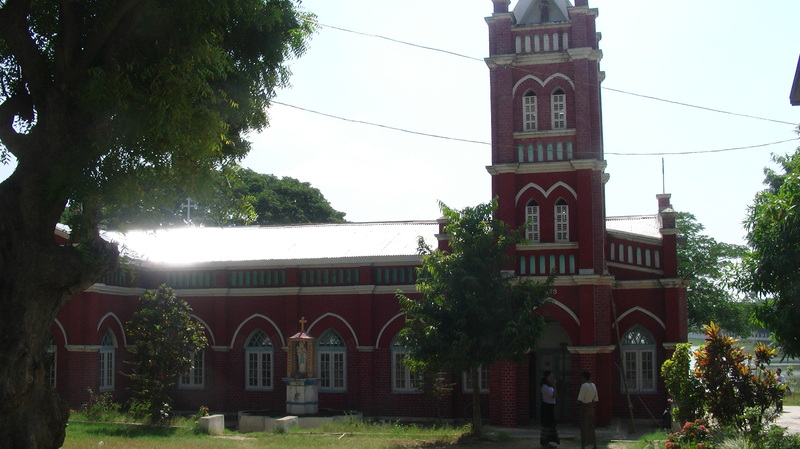 Although Uncle Bill Slim, with somewhat cruel pride, claimed total destruction of Meiktila in his memoirs, it is patently an exaggeration, as can be seen from the lovely church, built in 1929. Father Thomas Lazarus Father's Occupation Clerk, P.W.D. Sponsor May Rosa Theaney ? Father William Everard Father's Occupation P.W.I., B.R. Father Augustine Lewis Jacobs Father's Occupation Guard, B.R. Father Joseph Vincent Salgado Father's Occupation P.W.D., B.R. Father Herbert Rainford Father's Occupation Signal Inspector, B.R. Father Victor Pedroni Father's Occupation Teacher, A.B.M. Father Alfred Thaw Father's Occupation I.M.S.
Father Anthony Michael Valens Father's Occupation Head Clerk, P.W.D. Father Charles Albert Barron Father's Occupation Agent, Bulloch & Co.
Father Louis Joseph Vas Father's Occupation P.W.D. Father Henry Anderson Father's Occupation T.T.,B.R. Father Alfred Henry Mellican Father's Occupation A.P.W.D. Father Alfred Henry Mellican Father's Occupation A.P.I.,B.R. Father Norman Stanley Robert Father's Occupation Loco Foreman, B.R. Father George William Campbell Father's Occupation Driver, B.R. Father Henry Langtry Father's Occupation S.I.P. Father M.R. Thomas Father's Occupation Clerk, P.W.D. Father Thomas Stanley Father's Occupation S.J.P. (S.I.P)? Father Paul Rozario Father's Occupation Platform Inspector, B.R. Notes Melvil died 06 April 1938 ? Father H.B. Langtry Father's Occupation P.S.O. Father Alfred Thompson Father's Occupation T.I., B.R. Father William Shepherd Father's Occupation T.C., B.R. Father A. Bilimoria Father's Occupation Manager of refreshment rooms, B.R. Father Frederic John D'Castro Father's Occupation A. Foreman, B.R. Father Cecil R. Bernard Father's Occupation A.P.W.I., B.R. Father Cecil R. Bernard Father's Occupation A.P.W.I. B.R. Father George Stephenson Father's Occupation Driver B.R. Father V.T. Fomin Father's Occupation T.C.,B.R. Father O.G. Watkins Father's Occupation Agent, Steel Bros & Co.
Father P. Abel Father's Occupation T.T.E.,B.R. Father Wilfred Saxty Father's Occupation Loco Foreman, B.R. Sponsor Mrs S. Morear ? Father E.M. Law Yone Father's Occupation A.S.M.,B.R. Father Albert A. Gonsalves Father's Occupation P.W.I.,B.R. Father Jim Michael Cann Father Daw Oni? Notes There is also a signed statement re: the religious upbringing of any children from their marriage Witness ? Notes Signed statement re: the religious upbringing of any children from their marriage Witness ? Occupation - Occupation Health Asst. Mother Daw Dwe Sheppleman Mother Daw Khin Kyi?